There are a lot of things that technology can do for teachers, and for students (although, like with any toolset, technology can be misused). That said, perhaps the single most important benefit that technology will bring to ELT is personalization. As we saw in Part 1, good teachers already provide adaptive content, an adaptive classroom, and an adaptive curriculum to personalize learning. But well-managed technology can make this teacher-driven personalization exponentially more effective and more powerful. We all know that it’s needed. Today no one doubts the profound limitations of the traditional top-down, global, one-size-fits-all coursebook. Less discussed, but just as problematic, is the standard, global ELT methodology taught in CELTAs and the like; it’s just not reasonable to think that the same ELT methods and approaches will be optimal for a student in Brazil and at the same time be optimal for a student in Saudi Arabia. Personalization is the future of ELT, and technology holds the key … actually it holds two keys. One key is the algorithmic adaptive learning we looked at in Part 1, carried out appropriately and with an understanding of its limitations. The other key is open platforms. By the term “platform”, I refer to web services for ELT, usually cloud-based, that combine learning management tools (LMSs) with course content. Oxford, Macmillan, Pearson, and Cambridge all have various platforms. But these platforms are not open. They are closed platforms that allow limited teacher options and are basically another medium to deliver our old friend: the traditional, top-down, global, one-size-fits-all coursebook. And this is another current limitation of algorithmic adaptive learning for ELT: currently it is being used only with closed platforms for major publishers. By the modifier “open”, I refer not necessarily to free or open source, but rather to platforms that are designed to be teacher-driven, not content-driven. Open platforms empower teachers and schools to engage with and re-configure content to fit the specific needs of their students, culture, context, customers, etc. Open platforms allow teachers to use a range of content from a range of publishers, curate this content, re-configure and re-order the content, and, using the same authoring tools, create their own content and slot it in wherever appropriate. Open platforms are course creation and delivery tools; the resulting material can be delivered in class (printed out or by way an IWB or projector), online, or, optimally, as part of a blended learning course. Moodle, Sakai, Canvas are examples of an open platforms, as is my project, English360. By providing publisher content as the raw material, as well as authoring tools for teachers to create content, open platforms allowing teachers to manage that material as they see fit, and course design moves from a top-down, publisher-only product to a collaborative process among publishers, teachers, and the students themselves. Again, teachers have been assembling bits of content into courses for ages. If you walk back into the teachers’ room in many language schools, you’ll find teachers lined up at the photocopier. As I’ve explained to many publishers over the last few years, most of these teachers are not photocopying material because they want to steal. They are photocopying because they want to personalize. They may take a page or two from one coursebook, then some from another, then another page from a grammar resource, then copy an article from a local magazine with the exercises and tasks they made that exploits that authentic content. They select this content because they understand the students’ needs and interests, their strengths and weaknesses, their cultural background, the course rhythm…all the critical data that only a teacher can know, and that publishers can only vaguely anticipate and generalize in order to produce global coursebooks. Closed platforms are a publisher delivery mechanism for these global, generic coursebooks. Open platforms are tools that empower teachers by allowing them to do digitally what they do with a photocopier, by personalizing content and providing differentiated instruction that adapts to the needs of each student, each class, each school, each culture. Teachers are the ones working in the classroom, talking to parents, and experiencing each student’s learning. That role is indispensible to any realistic approach to adaptive learning in ELT, and open platforms make that possible. For adaptive content, homework or pre-class work on an open platform can be created on the fly with a few clicks, based on the knowledge of the teacher of the profile of each student or each class. Adaptive course creation on open platforms can range from out of the box publisher content, to curated courses taking units, pages, or specific tasks from a range of coursebooks and resources, together with course content authored by teachers specially for local needs. All can be easily adapted to learner performance by teachers on an ongoing basis as the course progresses. And for larger scale projects, a set of these customized courses, together with assessment tools, can evolve over time by way of the teacher community of practice, again based on a developing understanding of learner requirements. As stated above, at IATEFL next week, my colleague Valentina Dodge and I will be presenting a case study of a program with an adaptive curriculum that we set up for seven colleges in the Middle East, using an open platform driven by the local teacher community of practice. What about algorithmic adaptive learning hooked up with teacher-driven open platforms? Absolutely. In a blended learning program, this would be the best of both worlds: letting a machine do what it can do best, and letting humans do what humans do best. Using Knewton’s data infrastructure for the subset of content that is done online and is objectively scored will be a very powerful tool and of real value to every teacher. What’s interesting is that in most blended learning courses, the online component is often language presentation, focused practice and form-focused drilling, and pre-teaching vocab or other exercises that can be automatically graded. So that would be appropriate to the micro-adaptation that Knewton’s infrastructure can provide. The results could potentially feed in to classroom and curricular adaptation, although as noted before this will be more difficult with language teaching as opposed to topics such as science or maths. That said, the value of open platforms in blended learning is not really about what happens online, it’s about what happens in the classroom when the class can focus 100% on what only humans do: communicative, interactive activities, task-based and project-based learning, and messy, open and subjective communication. So, let’s look again at the three categories of adaptation (content, classrooms, and curriculum) and contextualize each of these within the primary purpose of adaptive learning, personalization. So, let’s sum up both posts and look at where we go from here. Adaptive learning is something that teachers have been doing forever, manually, by way of adaptive content, adaptive classrooms, and adaptive curriculum. It was always so natural for us that we didn’t call it anything special, other than “good teaching”. Recently, mechanical, algorithmic adaptive learning has become possible, for a very specific subset of learning activities: those that are discrete, online, and objectively scored. In ELT this is largely “micro-adaptive” content, such as form-focused practice and drilling, delivered as online homework or as part of a blended program. Given the holistic nature of language and language teaching, algorithmic adaptive learning will be harder to implement and easier to misuse than in other domains, such as science or maths. Led by Knewton, it has gained considerable commercial momentum, and, as “the next big thing”, major ELT publishers have all jumped on the bandwagon. It is these very same publishers that give us generic, one-size-fits-all coursebooks that many teachers believe focus on commercial success rather than learning outcomes. These coursebooks are certainly the antithesis of personalization, which has come to be seen as a critical road forward for ELT, and, when delivered digitally, come to us by way of closed platforms that severely limit the role of the teacher. So there is concern. But, technology has brought us other tools, and one of these is the open platform. Open platforms are designed to support teacher-driven personalized learning, and do so by way of adaptive content, adaptive classrooms, and the adaptive curriculum. For the right subset of content delivered through an open platform, algorithmic adaptive learning can be an invaluable tool, and the insights gained through the resulting big data can help teacher adapt the classroom and curriculum to student needs. But language learning is more subjective and holistic than, say, maths, and so for ELT professionals, Knewton’s toolset is both more limited (to a subset of content types) and more easily misused (because the big data insights come from a limited data set). In short, algorithmic adaptive learning is a potentially powerful tool that need not be feared by teachers, but instead looked at judiciously and used appropriately. 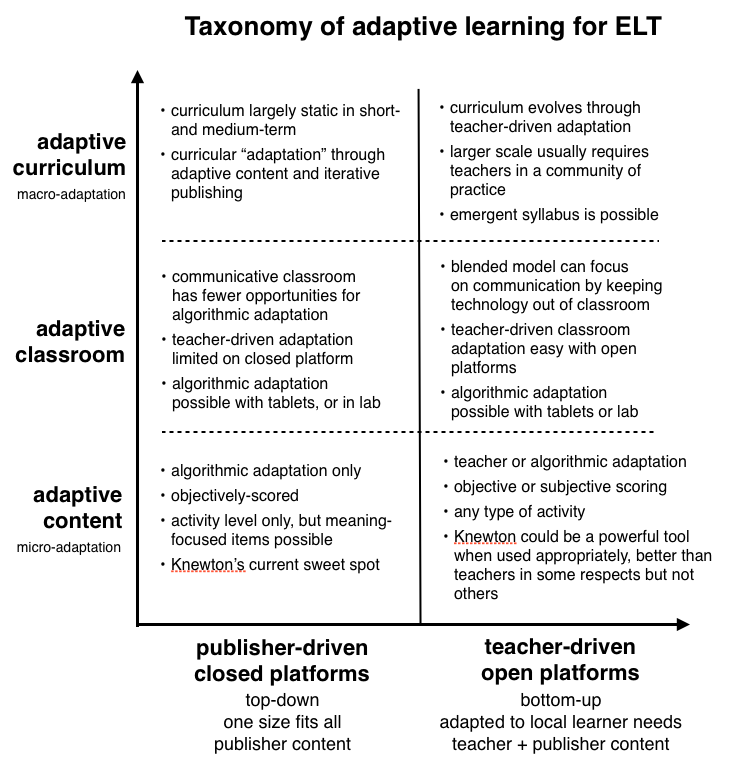 But adaptive learning is not done only by machines: teacher-driven adaptive learning through open platforms can empower teachers to be the protagonists of ELT technology, rather than its victims. Featured Photo Credit: Billy Wilson Photography via Compfight cc. Text added by eltjam. Nicely said. I can hear faint undertones of the Gettysburg address if I listen hard enough. 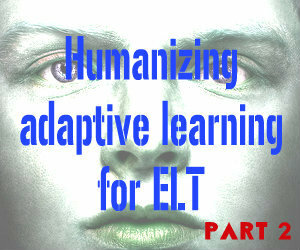 Thanks, Cleve, for a another enlightening post – one in which you seem to be taking pains to diffuse the perceived ‘threat’ of adaptive learning systems, by suggesting that they will play only a minor part in the ‘brave new world’ of ELT course delivery. Viz: “Recently, mechanical, algorithmic adaptive learning has become possible, for a very specific subset of learning activities: those that are discrete, online, and objectively scored”. And: “for ELT professionals, Knewton’s toolset is both more limited (to a subset of content types) and more easily misused (because the big data insights come from a limited data set). Ok, But if it is really so ‘limited’ in its application, how come (according to Philip Kerr) Knewton “has signed multi-million dollar contracts with ELT publishers like Macmillan and Cambridge University Press”? That seems like a lot to invest in a toolset that has only peripheral utility. Or maybe they don’t think so? Thanks for replying – it’s been really interesting discussion over the last few months. I jumped in late but have learned a lot already. I think there are several reasons for the investment by publishers. First, regarding the subset of activities that are “discrete, online, and objectively scored, I think I may have confused things with an ill-advised use of the word “discrete”…I’m not using it in the testing sense of “isolated from context” but rather using the everyday definition of “individually separate and distinct”. So with this proviso, there are a lot of useful activities that publishers can use with an adaptive learning data infrastructure: listening and reading comprehension using a range of texts, audio and video input and exploitation, meaning-focused items, etc. The main limitation is the need to be scored right or wrong, and creative task design can take this a fair ways. So, while the subset of activities is limited, talented authors can design content that still may turn out to be very beneficial to many students. So that is one reason for the investment: Macmillan and CUP can make quality activities that add value to their coursebooks, which compete in a complex environment where this value-add might tip a huge adoption from an Oxford title to CUP. Adding up the total top line for the 4 or 5 major ELT publishers gets us into the low billions, so a few million invested to become a first mover makes sense. A second reason would be for self-study material, especially for exam prep. That to me is the first “killer app” as they say for publishers using Knewton. Adaptive, personalized prep courses for IELTs or the Cambridge suite have huge sales potential. And for a lot of students it would be a useful self-directed course. The Knewton founder and early team came from standardized testing for the US upper education tests – GMAT, LSAT, SAT – so they are familiar with this problem (although they may not yet understand that with language learning the problem is in many ways different). And these two reasons are just for pedagogically valid content – there is also of course the gimmick effect. Certainly many education managers who make purchasing decisions will see adaptive learning as more than it really is, and make purchases based on the buzz and “shiny new thing” factor. We’ve all seen that before. Will Knewton and their publishing partners take advantage of this? Of course they will. Sales are sales, sadly. Will there be bad decisions to replace some F2F classes with online adaptive learning? Yes. Teachers losing jobs? Yes again, and I realize this is a step back for my argument (have at me!). I have been making normative statements about technology replacing humans in ELT (impossible for now) and not descriptive statements about what happens in a real world with finite resources but seemingly infinite stupidity. But I guess at the end of the day I’d feel more comfortable if our collective ire was directed at the education decision-makers who (despite being ex-teachers largely) are the ones making these misguided purchasing decisions. Why haven’t they been pilloried yet? No one is forcing them to buy Knewton-enabled publisher products. Or the publishers themselves? We talk about learning being essentially human, and language being essentially human…technology and invention and discovery are essentially human as well. So let’s not direct all our anger at the discoverers, but rather save some for those who misuse the discoveries. Hey there – I enjoyed the article Cleve. Thanks. I´m of the view that teaching languages will be more and more of an online affair in the years to come. And with it, content will be refreshed each day by teachers searching and creating lesson plans from the most relevant articles. I think the LMS market will fade – and we´ll see a new app that combines Skype like functionality and curation. At least as an online BE teacher – that´s what I want and need. So, this is technology coming from media curators and telecoms, not commonly associated with education. Hi Robert – thanks for commenting. Yes I agree with you that we need better synchronous tools as well. Internally, we’ve used both Webex and Adobe, and the results just aren’t great. We have some teachers using Skype and Google Hangouts with our curation platform, and it’s again OK but not great. We have a client that uses zoom.us and it presents issues, as do the others. Maybe it’s more of a bandwidth issue. Very interesting, your idea that the solution might come from media curators and telecoms…you may well be right. “content will be refreshed each day by teachers searching and creating lesson plans from the most relevant articles”… if I follow you, we’ve tried to create a process like this for a while in English360, but it’s complex. We have to review everything very carefully for originality – since many teachers are not 100% clear about what they can or cannot use off the web, they inadvertently breach copyright. We also review for quality. We do have a mechanism where you can exploit authentic content (i.e. the “articles” you mention) with activities, where the webpage with the content pops up on a new window so we’re clear on copyright. But, the article remains untouched on that new window – you can’t make a gap fill with the text for example (although, see http://www.lingleonline.com). What I think is interesting with this approach was that we decided to give the teacher-authors the option to copyright their work however they wanted – they could share it, by using Creative Commons, or they could go “all rights reserved” (ARR). If they choose the ARR option, and if any other teachers want to use that lesson, then the teacher-author is paid using exactly the same mechanism we use to pay our publishing partners such as Cambridge. So it’s a level-playing field for self-publishing. Thank you for the reply. Yes, there are no easy answers. Mmm bandwidth and server related I think. And it seems Skype/Microsoft have the advantage at the moment. I´ve tried Adobe and Webex but they over complicate registration, login, recording etc so in my opinion they´re cumbersome. And they don´t work. There is almost always a lag. I like the convenience of chatting with students, recording class and providing written transcripts on the fly. Why don´t you look at building your own Skype communicator? And integrate it with your platform. You could also brand it, and get past the bandwidth problem. Setting up a voip network is not as complicated as you might think. As far as content is concerned I think it has to be highly personalized. So, I don´t use any off the shelf content. And I don´t bother with quiz´s and all that stuff preferring the flipped learning method, with conversation to test comprehension in class. There are curators now I am sure you aware of who provide daily content across a wide range of channels for a flat fee per month. You can download the article, rapidly curate a lesson and share it without any licensing issues. Well, as long as you pay the licensing. Actually, it´s been a couple of years since I last visited your LCMS so I may well be speaking out of turn. If so , ignore me and forgive me please. I use a paid service with Skype called Calltrunk which records the conversation and provides transcriptions of the conversation as required. Not free. Although a student I currently work with uses Onecall to record the conversations. All I need to do is add Calltrunk to the Skype conversation and it gets archived. Then I visit the archive and share it with the student and anyone else, a school perhaps may want to view all the recordings for assessment purposes. The company behind the product are leaders in the data and analytics market, and they´re developing other products. For example – if you had a conversation with a student a few years ago, you can search it. You can also search words and see the word appearing in various conversations. From a language teaching and learning perspective that´s powerful. It means if you have your own VOIP network and communicator you have a very powerful, customized set of products. Again, these are of course paid services. I did months of research last year regarding LMS, Scorm, LTI, VOIP, WebRTC, data and analytics – and really, in my opinion these are the areas where the market will change teaching and learning. Web Real Time Communications allows anyone to chat from the browser – no download and better audio quality. It´s getting accolades and many new products are based around web rtc technology. Yes – I think content is on the web. We don´t need to move it. Annotation allows a teacher to annotate on the page. Web RTC means we will simply open the browser to access the content. And data will record everything and archive it. So, in my opinion this market will win a lot of teachers and students simply because it is so darn simple to use. I hope that helps to explain my views a little more clearly. I wasn’t aware of this at all actually…can you provide a link or two? Would like to check it out. You will know Scoop – well it is the same except in my opinion better, and branded of course. Last year, I was trying to get a startup off the ground called Talkvivo but I couldn´t get the fnance and quite frankly, I ran out of steam and decided to take a break. But, part of the strategy was to provide daily content from leading news resources like Reuters, Bloomberg etc and integrating these new technologies, with annotation into a website. The name eludes me at the moment but I would be happy to look it up. This is one of the companies I was looking at Cleve. But there is another one, which I considered better. Nonetheless, visit the site and you will get the idea. While I am here. I wondered if your team are able to provide a platform with online teachers to the market here in Brazil. I may have access to government tenders here but the numbers are large so the platform has to be rock solid, with local servers. Teachers are the main problem, content another – but, your team might have some of the talent to put it together. This was my primary motivation for Talkvivo. Interested? Let me know and we can have a chat on Skype – recorded and archived or course! Check out newsela. I will start to use it soon. Many, many thanks Rob. And could you say something about Talkvivo? It is a long story, but I will make it brief. Then Web RTC came along and I was considering developing a site with WebRTC , alongside the content, curation, annotation services. The product was conceptualized after numerous meetings with the largest online learning provider in Brazil. I had an IT team and was in the Microsoft accelerator program. However – in the end I ran out of time and money. The entire process took around 9 months before it quietly died. But, without any regrets. I learnt alot. The big advantage with WebRTC is that it works over low frequency broadband – which cuts out a lot of the problems associated with markets like Brazil. So, if you can access a wider market it is a compelling selling point for any online school or government department. It should work fine on dialup and is also one click, literally. So, no training involved unlike many LMS platforms. So, now I am looking for other opportunities – like minds who work with and understand VC’s. Hi Robert – shoot me an email at cleve@english360.com to schedule a skype call. I’m traveling much of the next 3 weeks but we can find a time I’m sure. Your entrepreneurial story reminds me of the first time I started building English360…it was the 1999-2000 period and I was running a language school in Buenos Aires and in the Hewlett-Packard accelerator program. Then the dotcom crash came along and our funding dried up. But I learned a lot, like you. Thank you for this Robert, and Cleve. It’s very interesting stuff. Perhaps, Robert, you could write and ELT Jam blog post about the tools you’ve been using? Robert, we’d certainly welcome a post from you on this subject if you’re willing. Drop me a line at tim@eltjam.com and we can work out how you want to go about it. Are you a part of the ELTjam team too Thomas. Apologies, I am not a frequent participant in ELT circles, so you could be a `rock star` but I wouldn’t know. Cheers all – good to chat! I’m not a member of the ELT Jam team. But I know their contact details are up somewhere on the site. I am confused – the contact page doesn’t list anyone in the thread. Cleve – were you invited to post? Yes, it’s an invite system. Enjoyed the articles, as well as the insightful comments. What most LMSs are missing today is quite simple–fun, feedback and friends! Learning needs to be fun for our digital natives. It needs to provide tailored feedback; lastly, it needs to allow students to connect. Agree completely that they need to be more fun and more social. I haven’t really found much of a solution to that, alas. In my experience, it seems most of the fun in a blended learning course is in the classroom, and it’s more fun than usual because most of the individual, heads-down activities have been done previously online. It’s an interesting problem, and like anything else in ELT, it’s tough to generalize about. But, fun is good, so as you say, we need to keep pressing on…. Thanks, Cleve! Will you post that research when it comes out? I think many would find it interesting. Our belief up to now seems to be that LMSs need to be more like social networks. I just posted on my blog about having fun and creativity. I think I would add independence to fun. There are quite a few ‘private social networks’ out in the www and I think one or two have been successful. But, my view is that education needs to be independently connected and social. Opt in or out, and be able to move around. A sense of community is essential but also independence. Because, if the student leaves one institution for another – they need to be able to take their community with them. From this I can see global niche communities emerging that share and discuss what is important to them – and crossing cultures for the greater good. Mmm Facebook is ‘and all in option’. It´s either in or out. And I don´t like that. Twitter less so – zoom around with more privacy. But, I would like to see an app like ‘whatsapp’ designed for education, entrepreneurship, and community. As well as teachers. It may well be that this will be the beginning of students direct relationship with teachers – and that schools and government are left out of the equation. Which I think is a healthy thing. Independence means taking responsibility for learning and we are not really doing that with kids today. At least that´s how I see it. In all the talk of adaptive learning, the people at Knewton seem to believe that they can help us become incrementally better at learning some things (and I accept this as true). But by the same token they never talk about helping us become exponentially better at language learning. One reason I think this is true is that they view language learning from the lens of discrete items and nothing is a better example of “discrete” than grammar. Despite attempts to change the way we look at language teaching, the mainstream history of language teaching over the last 50 years is the history of grammar’s ebb and flow. As a “conversation” teacher I often must resist the call from my students to look at grammar as the core constituent of language learning (largely because of tests). Now I have a new reason to fear grammar. In the past it was because I felt it often got in the way of the acquisition process. IMHO, grammar, because it is easy to measure, puts accuracy above fluency WAY TO EARLY. IMHO, grammar instruction also attempts to subtly separate grammar knowledge from word knowledge WAY TO EARLY. But now I have a new reason to fear grammar. Now I will fear grammar because it will become VERY profitable for publishers to promote self-study grammar instruction using Knewton-like systems (see your thoughts on self-study). It is reasonable to conclude that the longer a publisher can keep a student slogging thru the details of a grammar online the more money they can make (esp. if we are right in our assessment that much new grammar based instruction can eliminate the teacher). In the future, it would seem that the more “they” can make grammar the core of language learning, the more they have to gain FINANCIALLY. This is a scary thought because I am afraid that what is sound financially will also drive pedagogy and testing. My question, in a very leading way to you is this: Do you think it is possible that these incremental advances in grammar instruction that we see on the horizon from systems like Knewton, twined with a greater need for “efficacy” in publishing, and spurred on by the ability to potentially make more money from self-study grammar learning tools will result in a greater focus on grammar (and discrete item) study at the beginning levels of language learning? Are large publishers again, as always, favoring incremental changes over exponentially larger changes? And because Knewton-like systems are not direct change agents themselves (they view themselves in service to publishers) aren’t these machine learning systems also just agents of small, incremental change? By the way, I don’t believe I have an axe to grind. I am just trying to understand the implications for the teacher of how the people who have a the biggest stake in this process (you said billions of dollars) will attempt to drive machine learning systems keeping in mind that Knewton views publishers, not teachers, as their strategic clients.